Physiologically speaking, women have less upper-body strength than men and it takes the right exercises (and a whole lot of perseverance) for most women to achieve a strong, muscular frame. One good way to start is by doing pull-up bar exercises. Pull ups may sound intimidating at first, but, once you get the hang of it (pun intended), they’re one of the best workouts around. 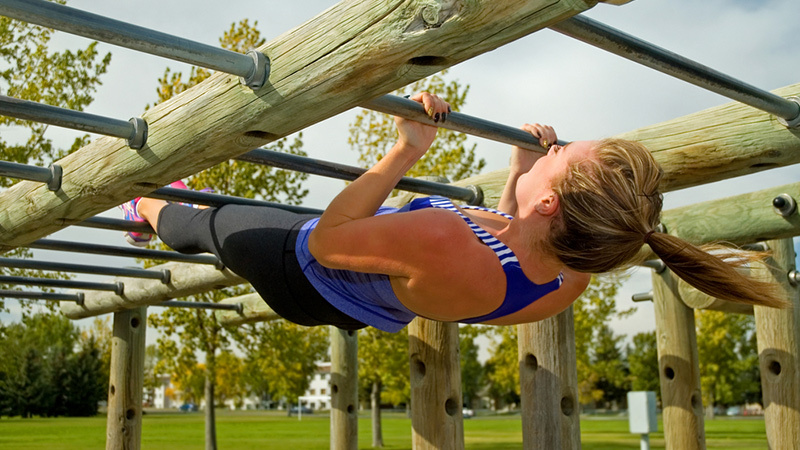 To give you an idea, here are some of the easiest routines women can do with a pull-up bar. The bar hang is one of the easiest routines you can do with a pull-up bar. It’s a perfect exercise for those who are just still starting out. At the beginning, it can be a tough one to perform, but starting out slowly can surely help. The trick is to tense your entire body and avoid swinging. You can try squeezing the bar as you’re hanging or teach your muscles to do a reverse shrug. This way, you’ll be able to learn how to use the big muscles on your back to perform a full pull up eventually. For the reverse shrug, all you have to do is take a firm grasp on the bar, lift your chest slightly so that your shoulder blades will be drawn back and down. Make sure that you are pushing your shoulders away from your ears. Once you feel comfortable hanging on a bar, you can progress to a flex-arm hang. This routine involves getting your chin as close to the bar as you can with your arms flexed. It works out your shoulders, biceps and back muscles. Use an elevated platform and jump on it to get yourself to the top position. Once your chin goes beyond the bar, grab the bar firmly and hold the position for as long as you can. You might feel some tremors and that’s perfectly normal. Keep your breathing as naturally as possible. If you want to engage your back muscles, try to use an underhand grip where your palms face the ceiling. The Australian Pull Up is basically a pull up that’s done in a horizontal position. Your feet can either be resting on the ground or an elevated platform. It gives you a bit of a leverage but this doesn’t mean that the routine will be that easy. To get started with this routine, you should first find a bar that is just at the height of your hips. Technically, it should be 2 to 3 feet off of the ground. Get yourself under that bar and place your hands a bit wider than your shoulders. You can use either an underhand or an overhand grip, depending on what’s comfortable for you. If you are still finding the routine too difficult, you can do the Australian pull up with your knees bent. The routine mainly targets the biceps, traps and back. This is a good workout to partner with the traditional pushups since it can help even out your muscles. The slow negatives are somewhat similar to a reverse pull up. They are very useful in helping you learn the best technique to properly do a pull up. Apart from that, it can also help you build greater strength and activate your core. For this routine, you need to begin in a flex hang position, with a box underneath your feet for support, if required. Jumping up from the box for momentum, perform a pull-up with your chin over the bar. Then, tense your whole body and gradually lower yourself without using any momentum. Try to hold your negatives to around 10 seconds. If you can do more than that, the better. You can perform it twice a week, making sure you do it longer than the last one. Once you have gathered enough strength, use the techniques you learned and start with a dead hang position. Pull yourself up slowly until your chin reaches beyond the bar. Keep your shoulders tight as you are doing the pull-up. It can help if you use the underhand grip in your first attempt. The initial pull-up you can do can consume most of your energy, and that’s is perfectly fine. You can’t expect to do several repetitions on your first try. Before attempting to do another pull-up, make sure that you rest for one or two minutes. Owner of www.AllPullUpBars.co.uk, Mike is a fitness expert who’s dedicated not only in developing programs that will work for his clients but also in motivating them to live a healthy lifestyle.